Five Lucians You’ll Love Knowing! 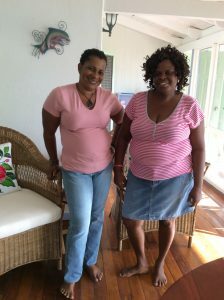 I want to introduce to you five Lucians who will be a great help to you during your visit to Marigot Bay. First and foremost is Luciana who is the glue keeping everything running smoothly when I am off island (which is most of the time!). She is in charge of the others and please do call her with any questions. We first hired her over 20 years ago and besides being a truly great housekeeper, she has learned to fix almost anything — from a broken toilet seat to a leaking toilet. And if she can’t fix it, she knows who to call. But the first person, you’re likely to meet when you arrive at the airport is Smally. 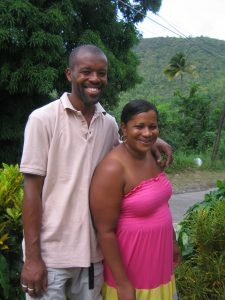 And we’ve known him even longer — right from the first time we went to StLucia – -so that takes us back to 1986. And he’s been driving us ever since. 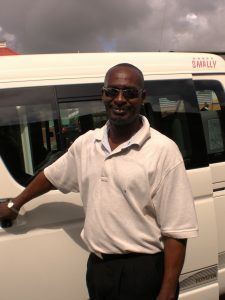 He’s courteous, a great driver and very knowledgeable about the island. Having him pick you up on your arrival, makes for a very stress-free arrival. Most likely you’ll next meet Chris. He will assist in carrying your bags and we do ask that you give him a tip for this; Smally can give you an idea of how much. And believe me, it’s worth every penny. He has to get them across the bay– heft them in and out of a boat — take them along the walkway to the stairs leading up to the lift — and then up the lift and to your vacation spot ! When he’s not doing this, he’s cleaning the pool at Hibiscus or taking care of gardening. My other two “helpers” you will see depending on which house you’re staying in. 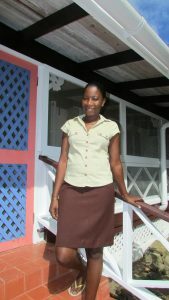 Anesta cleans the apartments at Hibiscus and those staying there will see her cheery smile. Mandy takes care of Flamboyant and Orchid — she’s the “Luciana” of those two houses and fully in charge. I know you’ll thoroughly enjoy all of them and their stories. Get to know them …..